The flight (Boeing 747) took off from Vancouver while Heathrow was still closed because of ash from the Eyjafjallajokull volcano in Iceland. When it reached the Isle of Man Heathrow was still closed so it was put into a holding pattern for a couple of hours at cruising altitude. 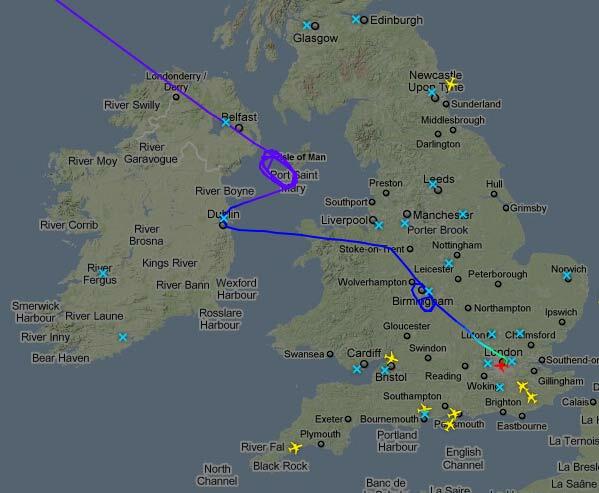 Other British Airways flights were being diverted to Shannon, Ireland and it looks like the airline and/or ATC gave up and sent the aircraft there, at which point it started descent to 26,000 feet. The British Government announced that at 10pm all UK airports would reopen. BA84 then turned back towards Heathrow while over Dublin. When the flight reached Birmingham it was put back into a holding pattern, probably because it would have reached Heathrow too early. Not a flight I would have liked to have been on!